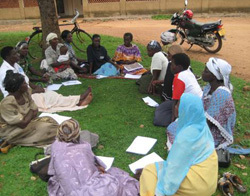 In Uganda, it is neighbours helping neighbours who are the first line of defense against the ravages of HIV/AIDS. Not the government, whose policies some accuse of hindering rather than advancing progress in the war against the disease. 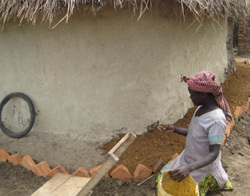 Livelihood programs to improve the household conditions of those infected and affected by HIV/AIDS. 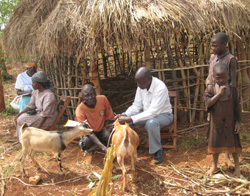 This includes developing and sustaining income generation such as from community or household gardens or livestock. Community awareness sessions to counter the myths and teach the facts about HIV/AIDS prevention, care and treatment, reducing the fear and stigma associated with the disease. Food security and proper nutrition to boost weakened immune systems and reduce the malnutrition and wasting that so frequently escalates and accompanies the disease, as well as help people stay on treatment regimens. Safe water and good hygiene, to maintain health in general and reduce the spread of a variety of other common diseases that can further compromise the immune systems of those already at-risk or infected with HIV/AIDS. UCOBAC volunteers meet to learn from and support each other. UCOBAC’s support is extremely comprehensive, starting with the training and equipment provided to the volunteers themselves. Each gets a bicycle for their own transportation plus a toolkit of materials and medical supplies for the families they will be visiting. They also regularly meet with their peers and trained counsellors to take advantage of the social support that will sustain them in this emotionally-taxing work. For the beneficiaries, the services offered are life-changing and life-saving. Recipients are selected by local leaders in each parish based on criteria that prioritize the most vulnerable – often, single mothers (widows) and sometimes grandparent- or child-headed families where HIV/AIDS has taken both parents. The program begins by assessing the family’s current living conditions and immediate medical needs. Thatched-roof huts – which provide poor shelter from the elements and are difficult to maintain – are upgraded to steel-roofed, semi-permanent structures. Latrines and safe water sources are installed, and households are equipped with clean mattresses, blankets, water containers and malaria nets among other basic supplies. Most importantly, each family head is given a start-up grant and training, which provide the foundation for a sustainable livelihood and ongoing income generation for themselves and their dependants. Grants for income generation are key to the program's long-term effectiveness. Once all that has been accomplished, the UCOBAC-trained volunteers begin regular home visits – the heart and soul of the program. They provide psychosocial counselling, offer first aid and medical care and refer complicated cases for specialized treatment at nearby health centers. They give patients and their family members practical guidance around hygiene and good nutrition – so important to keep up people’s strength as they contend with their symptoms. These dedicated and caring volunteers teach families the facts about HIV and AIDS, and help them apply positive coping and living strategies for a better quality of life overall. They also have the sensitive conversations needed about disease transmission and prevention, family planning, and how to prevent mother-to-child transmission (PMTCT), still a significant contributor to the spread of disease. Beyond HIV/AIDS, they offer malaria, cholera and nutrition education, child care tips and support, and they raise awareness about children’s and women’s rights. And most of all, they are everything a good neighbour can be: someone to confide in, a shoulder to cry on, a listening ear and a source of comfort with helpful, compassionate care for those who are stigmatized, isolated, frightened and in pain. Inspired by what you’ve read? You can help African families affected by the HIV/AIDS pandemic in by purchasing one of the related gifts below.